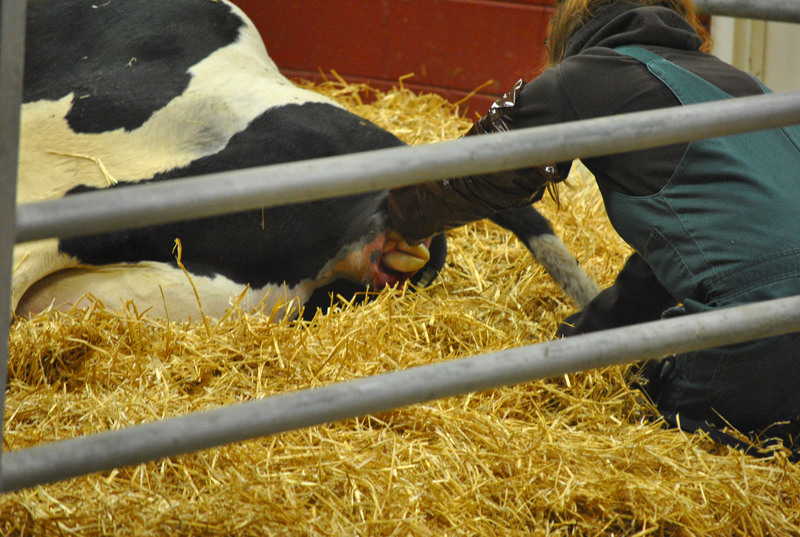 Saturday we went to Fair Oaks Farm. It was a girl scout outing for the family. 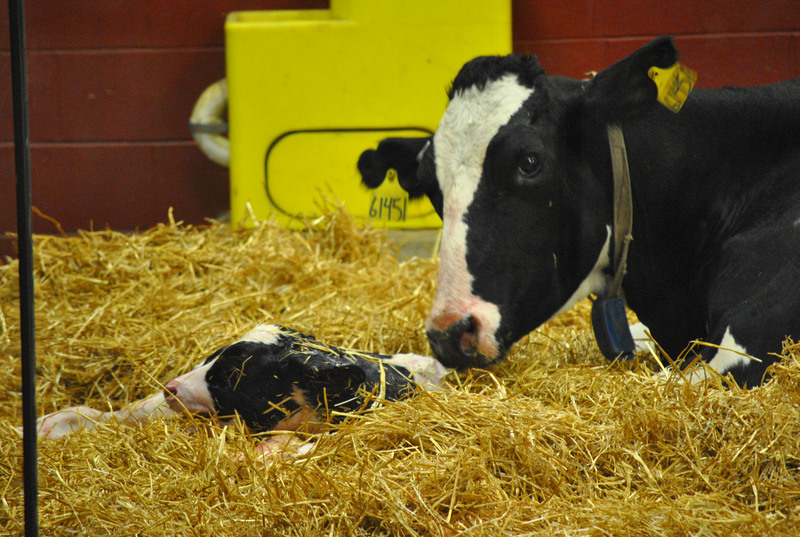 It’s one of the largest dairy farms in the country. 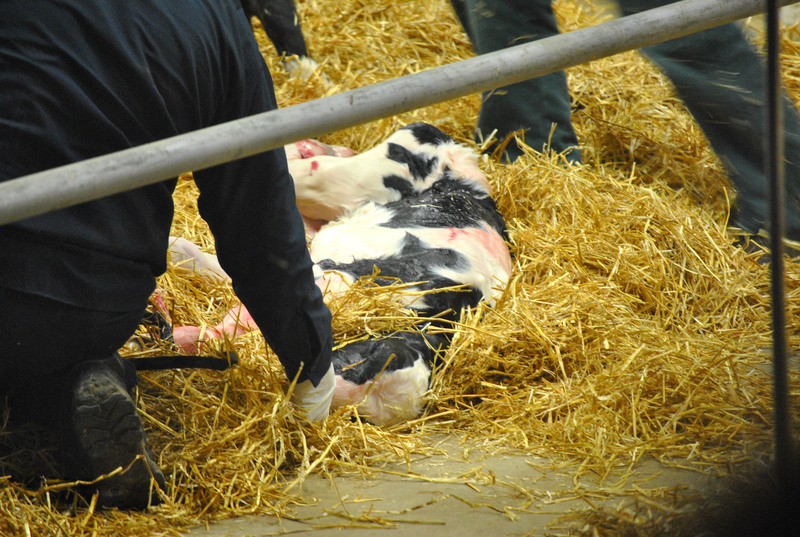 We were able to see a calf being born as well as tour the farm. What a great way to spend a Saturday. We also enjoyed some sweet swiss cheese. I’d never heard of it before, but we enjoyed it so much that it didn’t last the weekend. I think that we’ll be heading back there this summer. I brought along a tasty treat of breakfast bars. It was an hour and a half drive, and I’m always prepared. I found the recipe in the current issue of Everyday Food. I love that magazine. This recipe is simple and lends itself to so many variations. If you want it saltier, add 3/4 t of salt. If you don’t want chocolate, add raisins. Lower the peanut butter amount to 1/2 C and add some Nutella. 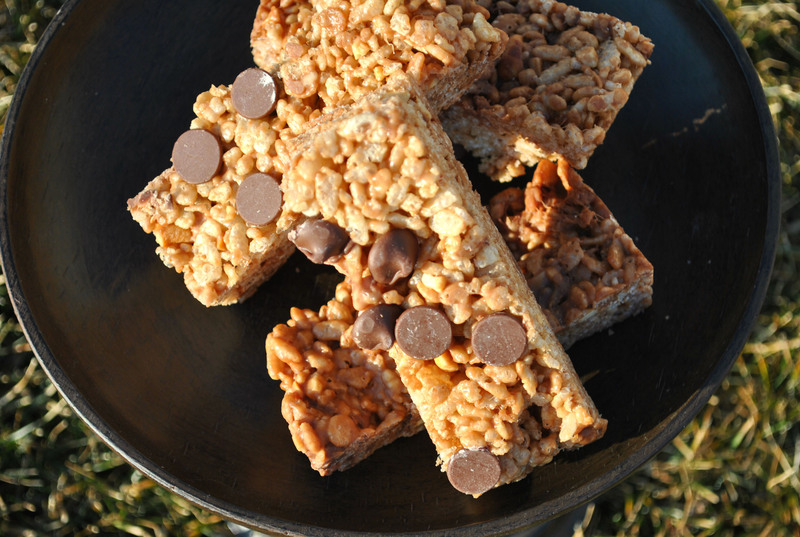 Use half the amount of rice krispies and add quick oats. Don’t have cashews, just use your favorite nut. 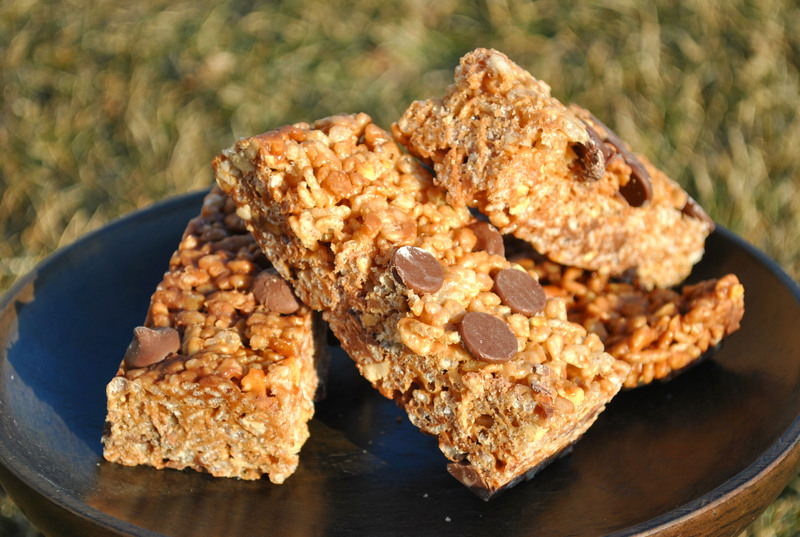 These are a great alternative to those breakfast bars in the grocery store. Cheaper too! Prepare a nine-inch pan (or quarter sheet) with cooking spray and parchment paper. In a large pot, melt the butter. Add the marshmallows, peanut butter, and salt. Stir until melted. Remove from heat and stir in the cereal and nuts. Let sit for a minute. Sprinkle some of the chocolate chips onto the prepared cooking sheet. Add the chocolate chips to the cereal mixture, reserving a small amount to sprinkle on top. Press the cereal mixture into the pan, sprinkle with reserved chocolate chips. Let cool. Cut into 12-16 bars. Wrap in parchment paper or Saran. These are a great on the go snack. Perfect for in the car or a snack in someone’s lunch. 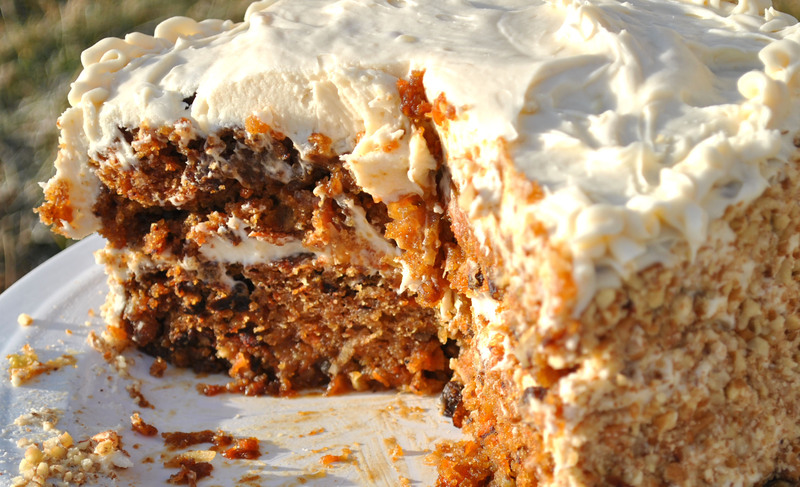 I must confess that before this weekend, I had never made carrot cake. Oh, I like it. It’s a great cake when made right. But I think that one of the reasons I’ve never made it is because of the frosting. Many times the cream cheese frosting is too sweet. Oh, and there is a restaurant in town that makes the best carrot cake ever. When I’m in the mood for carrot cake, I just drive over there and order a slice to go. That is, until now. 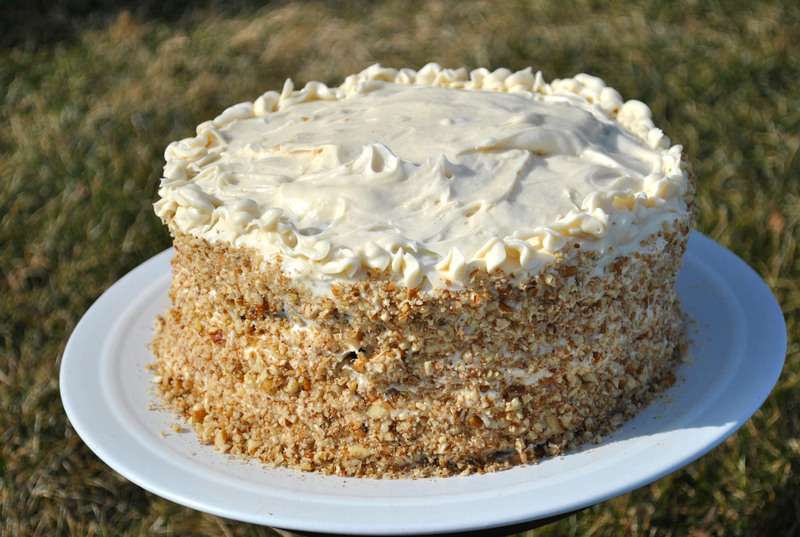 I found this Southern Living recipe after Chefs Catalog sent me a link about carrot cake. It made me want to make carrot cake. I searched and decided on the Southern Living recipe because the frosting didn’t seem overly sweet. I was right. Everyone thought this recipe was awesome. This cake is so moist, it’s the buttermilk glaze. The hardest part was grating the carrots, which I made sure to overgrate and freeze for the next time I make this cake. I was pleased at how pretty it looked with little effort. Oh, don’t let the coconut and pineapple throw you. I was confused by these ingredients myself, but was pleasantly surprised by the outcome. And by that I mean if you don’t like coconut (and I usually don’t), you won’t know it’s there. The pineapple is there to add moisture and allow the carrot flavor to pop. I added raisins to the cake because I like raisins in my carrot cake. Also, you can use walnuts, but I don’t like them so never buy them. I served each slice with a drizzle of caramel, just like the restaurant. Line 2 (or 3) 9 inch round cake pans with parchment paper and lightly grease the pans, set aside. In a medium-sized bowl, stir together the flour, soda, salt and cinnamon, set aside. In another bowl, beat the eggs. Add the sugar, oil, buttermilk and vanilla to the eggs. Beat until smooth. Add the flour mixture, beat until well blended. Fold in the carrots and drained raisins. Add the pineapple, coconut and nuts. Pour the batter into the prepared pans. Bake in a 350 degree oven for 25 to 30 minutes or until a wooden pick inserted in the center comes out clean. Place the sugar, baking soda, buttermilk, butter and corn syrup in a medium-sized sauce pan. Over medium heat, bring mixture to boil, stirring often, for 4 minutes. Remove from the heat and stir in the vanilla. Remove the cake from the oven and drizzle the glaze evenly over each layer. Let cool for at least 15 minutes before removing from the pans. Once removed from the pans, cool the cake completely on a wire rack. Cream the butter and cream cheese together until creamy. Add the sifted powdered sugar and vanilla. Beat until smooth. Spread the frosting on each cake layer. Garnish the sides with crushed nuts, if desired. Yesterday I was home with Meeshie. She was sick on Sunday and didn’t feel any better on Monday morning. I was actually off for Lincoln’s birthday and had planned to do quite a few things. Instead I stayed home and made soup. Not that Meeshie had any, but still. I also made some whoopie pies. I love making them because they are so simple and easy to store. Perfect for a fourth grader’s lunch. Today Meeshie is feeling more herself. Or maybe it’s the prospect of her Valentine’s Day party? Either way, she’s back to school. Sunday, on the other hand, was sad. She missed a birthday party and never left the couch. You know your child is not feeling right when that happens! Ah, but back to the soup. 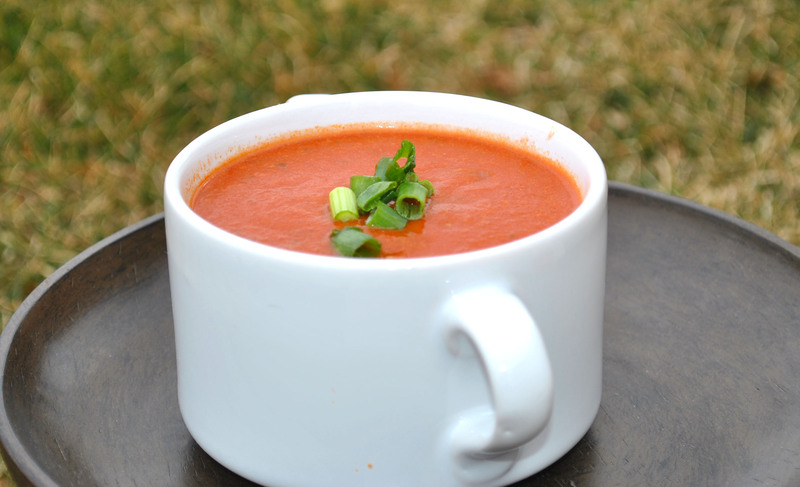 I made this simple and tasty tomato soup after going through one of my cook books. I know a lot of people collect cook books, but I don’t. I’ve found that if I buy one I may use one recipe out of the entire book. With the exception of some wonderful books from Williams-Sonoma. My husband found a collection of cook books for me when we were first married. I don’t have the whole series, but I do have a few great books. One of them is a soup cook book. I know I’ve shared my love of soup, so it comes as no surprise that I’ve made quite a few of these recipes. This tomato soup recipe calls for fresh tomatoes, but this time of year it’s best to use canned. Using the canned tomatoes actually make the soup even easier because I didn’t have to blend anything. If you use the fresh tomatoes, just skin them and chop them. In a large sauce pan, melt the butter. Add the onion, celery, carrots, and garlic. Saute for 2-3 minutes. Add the tomatoes, stock, thyme, ginger, salt, pepper and bay leaf. Bring to a boil, reduce heat and simmer for 30 minutes. Discard the bay leaf and slowly whisk in the bread crumbs. 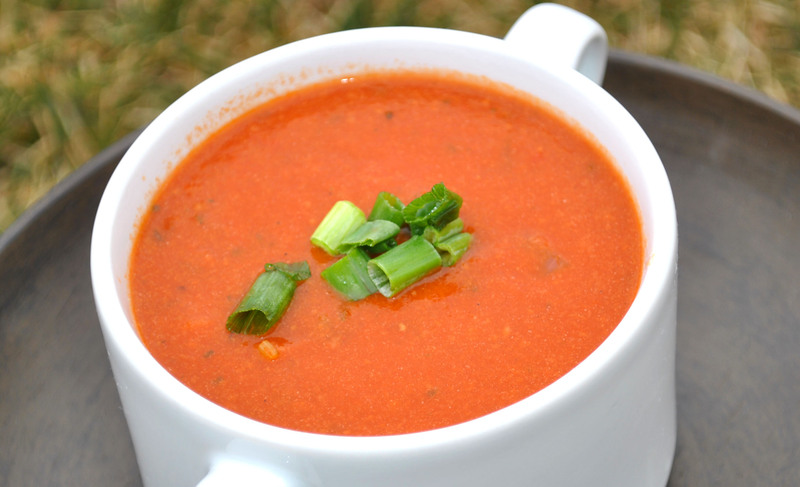 If using fresh tomatoes, in small batches puree the soup in a blender or food processor. Strain the liquid and return it to the pan. Stir in the cream and simmer for five minutes. Serve with your favorite sandwich. Last night Meeshie’s girl scout troop got together to work on a badge. That work involved fondue. And baking. How could that be better? Spending that time with some of the best moms. I only wish I had remembered my camera. Thanks Krista, for letting me help out. Now, we are lovers of fondue at our house. We have it every New Year’s Eve. But, I must confess that we stick to beef broth or cheese fondue. The girls wanted chocolate. 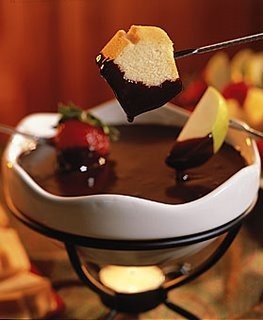 Chocolate fondue, perfect timing for Valentine’s Day. It’s so easy to make. The girls had a blast prepping all the food. And there was tons of it. That’s the thing about fondue. It never looks like enough food, but there is. We had pound cake. Which the girls also made. 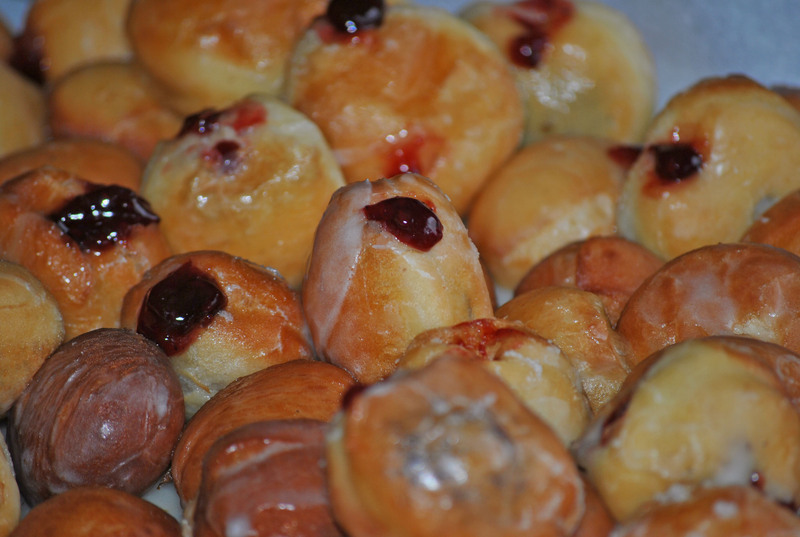 We had them put them in mini paper loaf pans for easy take home. We had bananas, pineapples, strawberries, rice crispy treats, oranges, pretzel rods, apples, graham crackers and two kinds of marshmallows. For the cheese fondue, we had bread, tatter tots, apples, pretzel rods, and veggies. We altered the cheese recipe to include chicken broth instead of the wine. Let me say that 12 girls may be loud, but they work well together. They chip in. They pick up each others slack. They were split up into two groups to make the pound cake. They went through the recipe and decided who would do what. Since Meeshie helps me at home, she designated herself the bartender asking each girl what they wanted to drink. It was such a great night, that we are already talking about how we can make it even better next year. Pour the whipping cream in an electric fondue pot on low. Bring the cream to a simmer and add the chocolate. Stir until melted. Add the vanilla and liqueur (if using). Dip in! If the fondue becomes too thick, add more whipping cream to thin. Are you a fan of a great dip? I am. I love dips. Cold dips, hot dips, it doesn’t really matter. Each one is good in its own way. 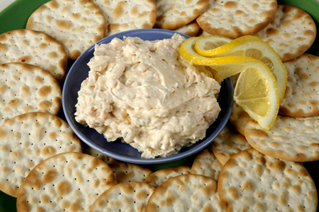 A good cold dip made ahead is ideal for a large crowd. But you can say the same thing for a good hot one too. Assemble and then stick it in the oven to enjoy as people start to trickle in. The first recipe is quick and hot. Hot as in warm, but also spicy. It’s spicy but not too spicy. You can substitute canned chicken for the cooked chicken breast. 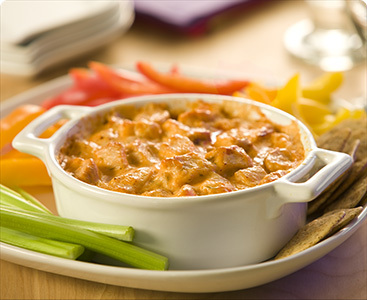 Or you can use leftover chicken, the dark and white meat will really add a lot of flavor to the dip. You can also sprinkle a small amount of cheddar cheese on top of the dip before you stick in the oven, but it doesn’t really add too much flavor so I don’t. I love this dip with tortilla chips, but wheat thins are also very good, or celery. The last recipe is one of my husband’s favorites. 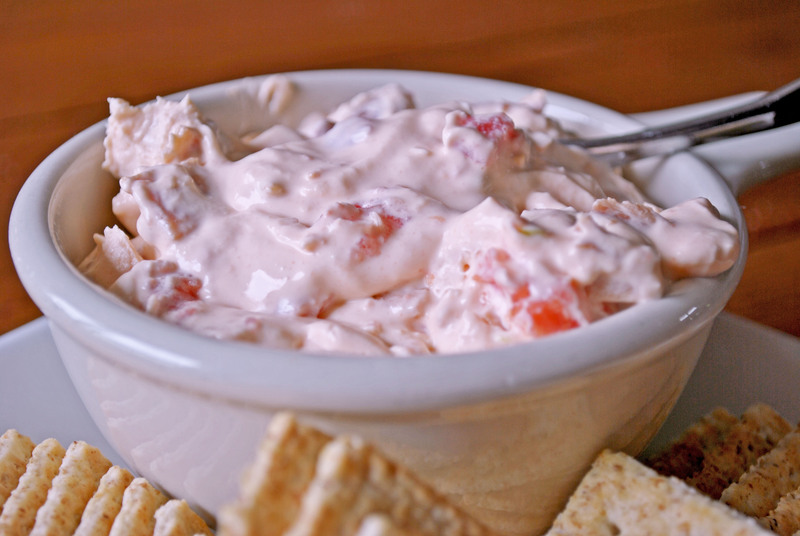 I had never heard of shrimp dip until I met him. It’s one of those things that shows up at every family gathering. That is, if my husband remembers to ask his father to make it. Mix all ingredients together. Place in a casserole dish and bake for 35 minutes in a 350 degree oven. Serve with your favorite crackers, chips or veggies. Mix the cream cheese, onion soup and shrimp together. Chill for at least 4 hours before serving. Serve with chips or crackers. You are currently browsing the Meeshiesmom's Blog blog archives for February, 2012.